I’ve finished and gifted a stealth knit! 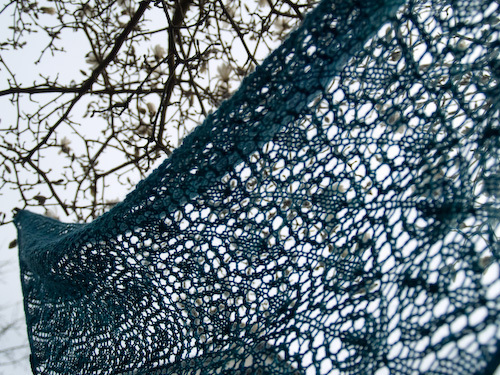 Ravelry is fabulous in many, many ways, but it does make it tricky to knit for other knitters, which is why this is the first anyone is seeing of my take on this pretty shawl designed by my talented friend Kristen Hanley Cardozo. 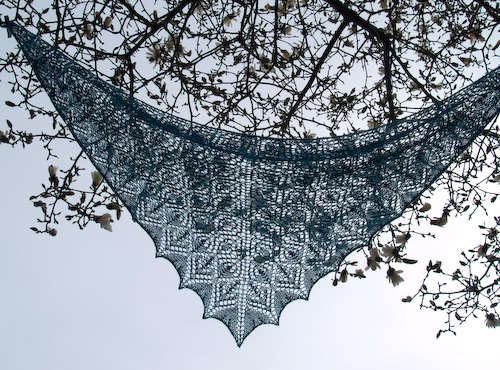 One of the things I love about the way Kristen wrote this pattern is that you can essentially build your own version of the shawl based on how much yarn you have, how large you want it to be, and how ornate you’d like the edging. Kristen has included a pattern map that shows your best options in every scenario. I followed my own path and combined two of the edging possibilities in a way that wasn’t suggested — I liked the symbolism of teardrops becoming “heart leaves” for this particular friend in this moment of her life — and it worked out beautifully. The yarn is Schaefer Anne in a teal and blue colorway. Anne is a sock yarn, and a tough one — it contains both mohair and nylon — but it softened nicely after a swim, and again, resilience with a bit of a shimmering halo seemed appropriate in this gift. Another thing I like about this pattern is that it’s named for the leading lady of Jonathan Strange & Mr Norrell, a book I was finally able to enjoy at the end of last summer during those long and multitudinous newborn nursing sessions. I’m a sucker for knitwear inspired by literature. “Anne” is one of my favorite yarns. Which reminds me that I currently have none in my stash. I must do something about that! 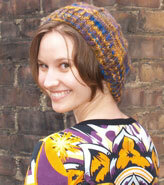 And the pattern will shortly jump into my queue on Ravelry. (Thank you, I think?) Beautifully done. You know she will feel the love in every stitch. I am so impressed that you can knit lace while caring for an infant! You have a magnolia in your yard! So jealous! The shawl is gorgeous, I’m seconding christina. The shawl is gorgeous. 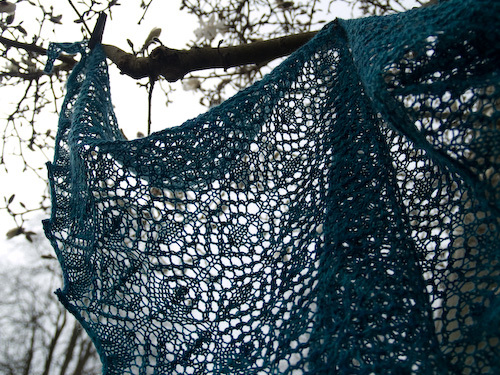 I will need to check out the pattern – I love the idea of a sort of creat your own shawl. Just gorgeous! It’s delicate without being fussy. I enjoyed Jonathan Strange & Mr. Norrell immensely! What an unusual book — the tone really lured me in, and the footnotes were always interesting and just bizarre. Lovely shawl. I am also in love with art or patterns inspired by literature. Did you like the book? You don’t have to answer this, but are you an English teacher? Sorry, my curiosity is getting the best of me.